Shri Kaul, Chief General Manager, SIDBI, heads the Service Sector and Equity & Risk Capital Verticals of the Bank. Prior to his present assignment, he was incharage of the Business Development in North and West India. He has also served as CEO of SIDBI Venture Capital Ltd. � a venture capital arm of SIDBI. 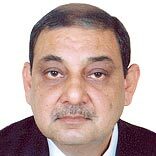 Shri Kaul has a vast field-level experience. He has been part of the Senior Management team in the policy and operational departments of SIDBI covering various credit related areas. "The change begins with me." "I am going to clean up politics." "I am not looking for a job. I will create jobs." "You see a challenge. I see opportunity." Copyright © 2013 Franchise India Holdings Ltd.